Starting today, Sea of Thieves players can jump in to the game's latest free content update. 'Shrouded Sails' adds a "treasure trove" of new content and improvements based on community feedback. With new treasures and unexpected twists on favourite encounters, 'Shrouded Spoils' should give you and your crew of pirate pals more exciting reasons to set sail on a new adventure. The addition of fog that can appear suddenly and cloak all manner of dangers at sea and on land. New Merchant Alliance items to find including the explosive Mega-keg, Crate of Ancient Bone Dust and Mermaid Statue Gems. More skeleton forts to take on as six new forts become active making nine in total. 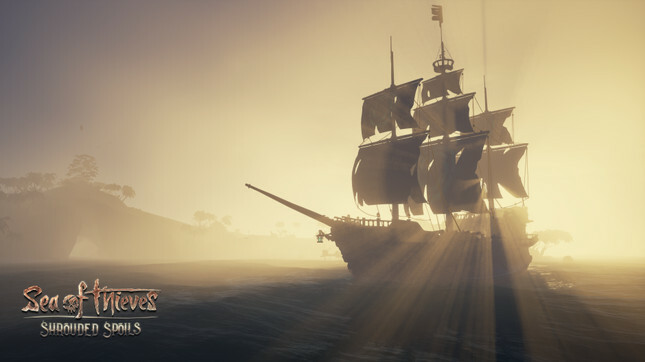 Improved skeleton ships including the addition of a new skeleton sloop, a new ‘Battle of the Devil’s Roar’ skeleton ship skirmish and the addition of roaming skeleton ships who display varying levels of aggression. New ways to express yourself including all-new ship customisations – cannons, wheels and capstans – and the time-limited ‘Wailing Barnacle’ ship and cosmetic set. A range of new Pirate Legend Commendations for Athena Levels 1-10. More frequent appearances from the Kraken (who’s also learned some new tricks), a range of new Megalodon variants to find and rewards and commendations for defeating these monsters. The 'Shrouded Spoils' update is available for free to all Sea of Thieves players on Xbox One, PC and Xbox Game Pass. Are you still playing Sea of Thieves? What do you think of the content updates so far?